In Japan, as we discussed last week, when a holiday falls on a Sunday, the following Monday is treated as a holiday. Many workers and students will have three days off from Saturday through Monday. Now. When a weekend is extended to include Monday like this, what do you call it in English? The answer is a “long weekend“. You can also call it a “three-day weekend”. Now. 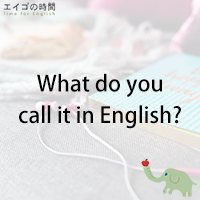 Let’s look at this question: What do you call it in English? This question is used when you want to know how to say something in English. For example, what do you call it in English when you take a picture of yourself with a smartphone? What do you call the red thing on a rooster’s head? What do you call a person who studies weather? It’s certainly a useful question, especially if you’re learning English. What do you call a person who studies weather? ところで、今日はこの疑問文に注目したいと思います。What do you call it in English? 「英語で何て言うの?」と訊くときに使う疑問文です。例えば、「スマホで自分の写真を撮ることを英語で何て言うんだっけ?」と訊きたいときは、What do you call it in English when you take a picture of yourself with a smartphone? です。「雄鶏の頭の上に載っかってるあの赤いヤツ、(英語で)何て言うの?」と訊くなら、What do you call the red thing on a rooster’s head (in English)? です。お天気について研究している人のこと何と言うか知ってますか。分からないときはこう訊ねます。What do you call a person who studies weather (in English)? What do you call it in English when you take a picture of yourself with a smartphone? – Selfie. What do you call the red thing on a rooster’s head? – A comb. What do you call a person who studies weather? – A meteorologist.